During her sit-down with Barbara Walters for the journalist’s annual ‘Most Fascinating People,’ Secretary of State Hillary Clinton chatted about one of her most famous attributes - her hair. Clinton may have a stellar political background, but Walters chose to talk to Clinton about her famous hairdo and its constant evolving. “I do not travel with any hairdresser, or anybody, to help me do that, and I’m not very competent myself,” Clinton said to Walters. “I’ve been admitting that for years, which should be obvious to everyone,” she joked in the interview. “So I said: Enough — we’re just going to try to go with as simple as possible,” she added. 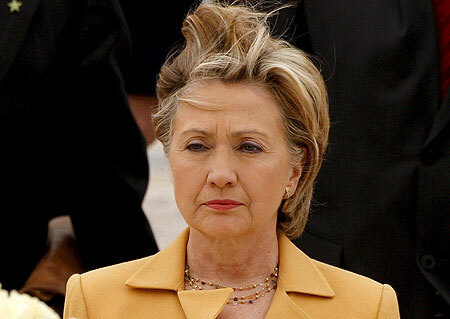 Clinton’s ‘do first gained attention when husband Bill became President during the 90s. Back then, Hillary was often found sporting a headband. Now though, she’s opted for a ‘simpler’ slicked back ponytail. The secretary of state has announced that she will be resigning from her post in the new year, leaving the door wide open for an array of opportunities - most notably another run for presidency in 2016.